The Mangar Bathing Cushion is a very high quality, comfortable, lightweight and totally portable inflatable bathing cushion, that is incredibly easy to position and use, and is supplied complete with its own battery operated Airflo compressor. Manufactured by Mangar International, a world leader in the production of inflatable moving and handling equipment, and bathing equipment for the elderly, the disabled and for the Emergency services, the Mangar Bathing Cushion has a very clever internal honeycomb structure that makes it very supportive, very hard wearing and very reliable. The bathing cushion has a very easy to use hand held controller and is designed to let the user lower themselves comfortably and gently to the bottom of the bath. Once there a user can choose whether or not to leave a small amount of air in the cushion and use it as a back support, or release all the air to lie right back and bathe as normal. When the user has finished their bath the Mangar Bathing Cushion is simply re-inflated, gently raising the user to a position level with the top off the bath, allowing them to exit the bath with ease. The bathing cushions Airflo compressor is battery operated, making it totally portable, and will not operate if there is not sufficient charge available to both lower and then raise the user, preventing the risk of a user finding themselves stuck in the bath. 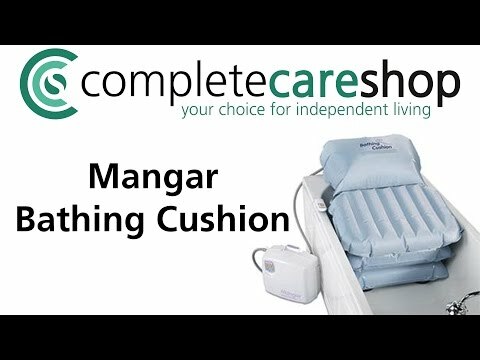 Requiring absolutely no installation, weighing a total of just 2 kgs (4.5 lbs), and featuring a handy new carry handle, the Mangar Bathing Cushion is exceptionally portable, making it ideal for taking away on visits or on holiday. I'm very pleased with the bathing cushion. It's easy to operate but important to dry off after each use. I can have three baths before I need to recharge the compressor. The Bathing Cushions arrived in good condition and in good time. At first, my husband found the manual a little lacking in explicit details, so he phoned the customer care number, where he was helped by a kind and competent consultant. He has since used the cushions, and finds them good. Having charged the battery as instructed it is easy to use the cushion. I find that it loses are between one day and the next, so don't expect it to stay inflated for several days. If fully deflated when bathing you still have a wallow!